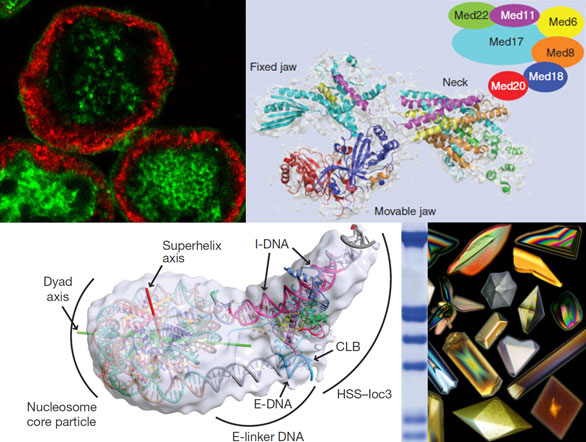 Traditional molecular biology technologies and even modern synthetic biology technologies do not allow for convenient modular assembly and disassembly of co-expression vectors for production of multiple proteins in a single eukaryotic cell. The MultiBac™ expression system uses DNA recombination to allow for easy, high-throughput compatible construction of baculovirus vectors for multiprotein expression in insect cells. Multiprotein coexpression is required to produce protein complexes, such as multivalent vaccines, or multiple individual proteins in the same cell, such as for signaling pathways. Multiexpression technologies are also the cornerstone of the emerging synthetic biology revolution. The MultiBac™ platform has been used for production of whole intact signal transduction pathways such as GPCR signaling cascades, kinase cascades, and protease cascades. MultiBac™ has also been used for production of virus like particles (VLPs) and a wide variety of multiprotein complexes. Baculovirus Expression Vector Systems (BEVS) such as MultiBac™ are a front line technology platform for production of protein kinases, GPCRs and ion channels for drug discovery, and are a major area of interest as delivery vectors for gene therapy. Insect cell expression using baculovirus as a vector is also becoming increasingly used in manufacturing of biopharmceuticals. MultiBac™ transfer vectors are fully synthetic, comprising only functional DNA, and as a result are small and easy to handle. The MultiBac™ baculovirus genome (DH10EMBacY) is under continuous development to remove harmful/non-essential genes (e.g. v-cath and chiA) and DNA recombination hotspots, and contains an integrated fluorescent protein expression cassette to allow for easy monitoring of virus titer. MultiBac™ is presently used by over 1000 academic and industrial laboratories around the world. 1. Bieniossek et al 2011. TIBS. 2. Trowitzsch et al 2011. Expert Review Proteomics. 3. Berger et al 2004. Nature Biotechnoloy. 4. Fitzgerald et al 2006. Nature Methods. 5. Fitzgerald et al 2007. Structure. 6. Simon Trowitzsch 2010. J. Structural Biology. 7. Yamada et al 2011. Nature. 8. Koehler et al 2016. Nature Methods. Genetic code expansion (GCE) is a powerful method to incorporate artificial amino acids into polypeptide chains to create synthetic proteins with novel functions, with many applications ranging from discovery science to molecular medicine. Until recently, this method has been mostly confined to small individual proteins representing a limited repertoire of cellular activity. Biological function in humans, however, is typically catalyzed by large protein machines, often comprising ten or more individual protein subunits. An international team of scientists from University of Bristol, EMBL and the Karlsruhe Institute of Technology have now developed MultiBacTAG™ (download paper here), a powerful system to enable genetic code expansion in complex multiprotein machines. Please contact us for reagent details.